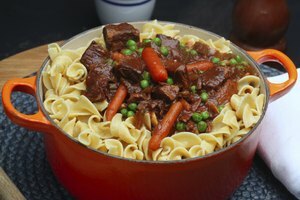 Corningware cookware is a longtime favorite with cooks, largely because of its rare ability to go directly from freezer to oven without harm. This physically durable ceramic cookware will last for decades if it's kept clean and well cared for. Although sturdy, Corningware isn't indestructible and in fact is often damaged by cooks with a too-enthusiastic approach to cleaning. 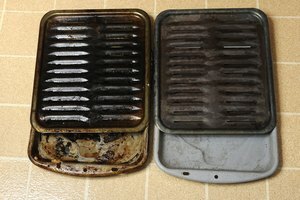 Following a few simple cleaning techniques will help preserve your cookware and its sleek finish. 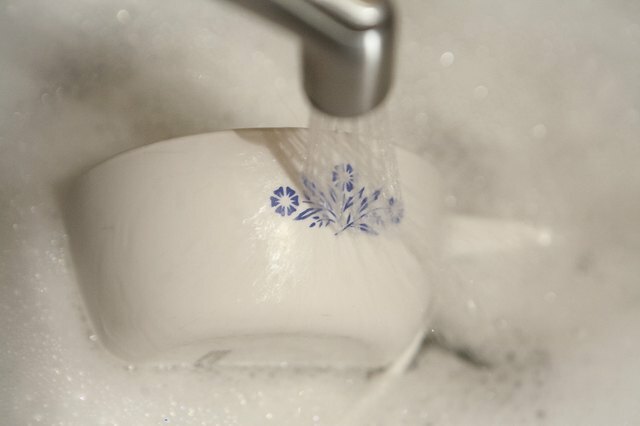 For ordinary daily cleaning, a simple wash in hot, soapy water usually suffices. 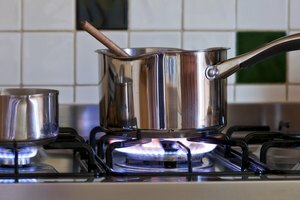 It's typically helpful to soak the cookware first, to loosen any baked-on sauce or food debris, making it easier to remove. Scrub the ceramic surface with a sponge, soft cloth or dish brush, as needed. For stubbornly stuck-on food, scrape with a nylon scrubbing pad or a wooden spoon until it comes away. Never use an abrasive cleanser or a metal scouring pad, which can damage the surface of the cookware and potentially shorten its life. You can safely place Corningware in your dishwasher, though crusted-on food should be removed first. Otherwise, the dishwasher's heat could bake it on even more firmly. After frequent use, it's not uncommon to find dull grey marks marring the appearance of your Corningware. 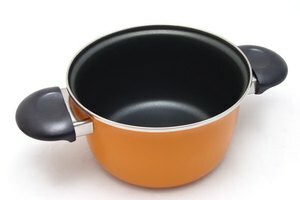 These are caused by using metal utensils with the cookware, a practice Corning strongly discourages. 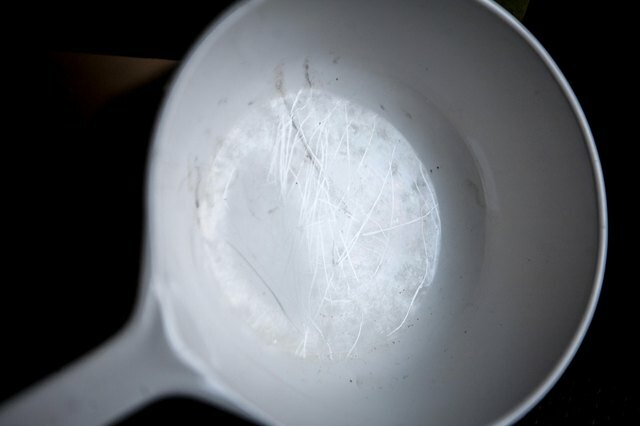 You can remove most of these grey marks with a sponge and a non-abrasive cleanser, such as baking soda or Corning's own cleaning and conditioning product. Aside from removing those grey marks, the Corning cleanser helps remove trace discoloration and restores the cookware's sheen. 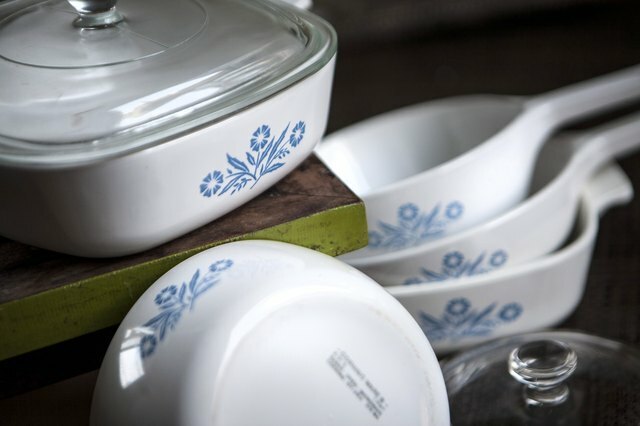 Corningware's durability makes it a thrift-store staple, but these used pieces are often heavily soiled or stained. Rust and hard-water "scale" can be removed with a vinegar soak or a specialized cleanser, and bleach can minimize many other stains. The powerful detergents used in dishwashers will also remove many years of baked-on food, if you immerse the piece in hot water liberally filled with detergent. Let the cookware rest in the soaking solution overnight, then hand-wash it the next day with a nylon scrubbing pad and non-abrasive cleanser. If all else fails, place the Corningware inside a garbage bag and spray it liberally with oven cleaner. Seal the bag and let it rest overnight, then rinse and wash the cookware the next day. 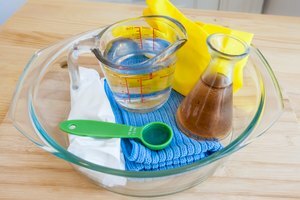 Although Corningware cleans up nicely after just a modest effort, establishing a few good habits can help minimize your cleaning efforts. For example, spraying your cookware with pan spray before you cook can help keep food from adhering. Whenever possible, lining your cookware with parchment paper is especially effective. 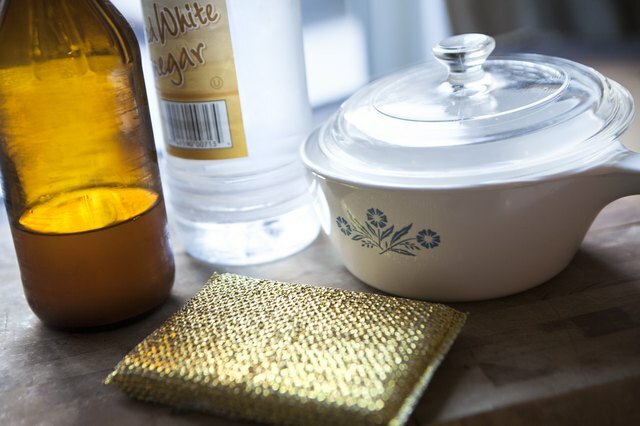 Aluminum foil works as well but produces those annoying grey marks, unless you line the Corningware first with parchment and then with aluminum. 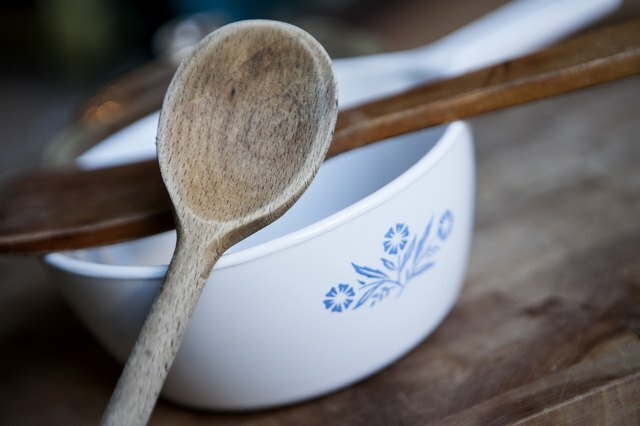 Use only wooden, nylon or silicone utensils with your Corningware, both to avoid grey marks and to prevent scoring that can shorten the life of your cookware.